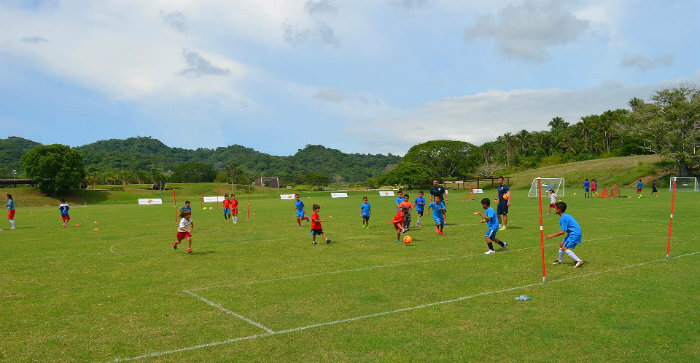 The focus is on giving the community of San Pancho and its environs the opportunity to come in and see how the Atlética de Madrid soccer instructors train the young athletes. San Pancho’s La Patrona Polo & Equestrian Club will open its doors this week during the Atlético de Madrid Summer Soccer Camp, which is taking place from July 17 through August 11 on club grounds. The open-door day is focused giving the community of San Pancho and its environs the opportunity to come in and see how the Spanish coaches from the Atlética de Madrid Soccer Academy train the young athletes. “This soccer camp will put the Riviera Nayarit on the map as a key destination in the sporting world,” said Nacho Ejido, Business Director of La Patrona Polo. He explained that while the club was created for polo, for this camp they wanted to create an alliance with one of the top clubs, which is recognized worldwide for its soccer training camp. Around 50 youths between the ages of 6 and 18 will be attending the four-week camp, where they will have the opportunity to learn the soccer techniques and tactics taught according to the Atlético de Madrid methodology. The daily training program is the official one for the Spanish team, with bilingual instruction by coaches Sergio López Sánchez, David Galán Gutiérrez, Alberto Carrasco and Oscar Sivert, all endorsed by the Madrid Football Federation. “It seems to us this project has a spectacular future. The Atlético de Madrid is encouraging this type of program in different cities in Mexico; it has nothing to do with the facilities and the material, what’s most important is the enthusiasm with which the kids attend, which motivates us and makes us just as fired up,” commented Oscar Sivert, who spoke for all the judges. The training takes place from Monday to Friday, from 8:30 a.m. to 5:30 p.m., and the kids can choose to attend anywhere from one to four weeks. The first week began last July 17th and ended Friday the 21st. The second week is from July 24 – 28; the third week is from July 31 – August 4; and the fourth and last week is from August 7 – 11. Upon registering participants receive a welcome Packet from the Atlético, an Official Campus Accreditation Diploma and training equipment. The Polo Lounge is open with food and beverage service for players’ parents and family members. During that time parents can take tours to view the Club facilities. The can also visit the town of San Pancho and enjoy the local gastronomy, art, shops and boutique hotels. The Atlético de Madrid has been around for 110 years and is one of the clubs with the most titles on an international level. In the past five years, it has participated in nine European finals, winning seven of them. It’s known for its fervent fan base, one of the most famous and passionate in Spain and the world.